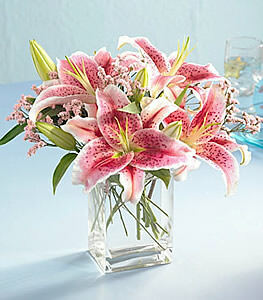 Lovely and fragrant Stargazer lilies are a wonderful way to celebrate a special day - or make an ordinary day special! Enhanced with sprays of delicate limonium, lilies are beautifully arranged in a clear glass cube vase. Vase may vary from item pictured. It was very nice, and I appreciate the attention to detail you spent making sure it was going to the right place.Thank you.